Baby Groot was “born” at the end of the first Guardians of the Galaxy film, and the extraterrestrial creature is a tiny, scene-stealing superhero in Vol. 2. Stay tuned through the closing credits of Guardians, Vol. 2 to spot Groot’s “contributions” throughout. Groot’s name appears throughout the credits – in graphics, special effects and various other departments – which are worth sitting through for the inevitable Marvel movie-ending Easter eggs that hint at future action. 2. Baby Groot is an unofficial Earth Day ambassador. 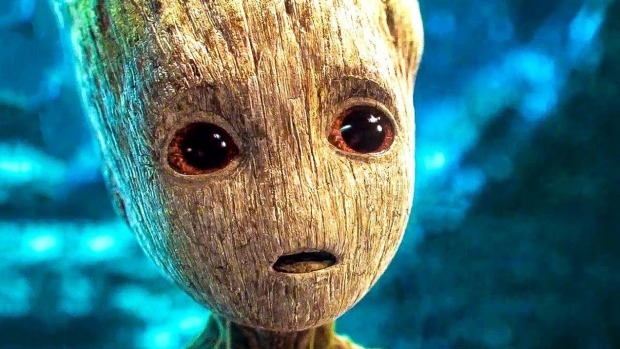 Marvel, which considers Groot to be “the galaxy’s top tree,” joined with the Disney Conservation Fund and the Nature Conservancy to plant a tree every time the hashtag #GrootDanceBomb shows up on social media. Marvel aims to donate $250,000 by the time the film opens Friday. 3. Baby Groot’s sweet appearance belies his terrible temper. “He’s completely adorable, but has a lot more anger issues than adult Groot did,” says writer-director James Gunn. 4. Co-starring alongside actors Dave Bautista and Chris Pratt, who both stand over 6 feet, Baby Groot proved to be a challenge for the cinematographers framing the shots. They used a sculpture of the 10-inch diminutive character, which was created entirely in CGI for the film, and special camera rigging to capture Baby Groot’s perspective amid the other superheroes. 5. Franchise star Pratt, who plays Guardians leader Star-Lord, knew early on in the filming that he could be upstaged by his tiny co-star.